The POC Fornix provides ultimate protection in a lightweight and well-ventilated construction. POC has used the Aramid bridge concept, initially developed for the ground breaking Trabec trail helmet and optimized it for the Fornix structure. By applying Aramid in strings and molding them together with the foam liner, the helmet is kept lightweight, but at the same time offers increased stability, protection, and provides better energy absorption. The ventilation system is built on 6 vents at the top using a sliding plate for easy opening/closing, as well as front and rear vents in order to allow air to easily flow through the helmet. The front of the Fornix is designed not only to seamlessly integrate with your goggles, but also to prevent your goggles from fogging. Vertical vents that channel the air downwards achieve this. The Fornix helmet is equipped with a turn-ring size adjustment system so you can dial it in to achieve that perfect fit. Great helmet for the money!. This is the first helmet that my husband said is actually comfortable. It is so lightweight and easily adjustable. Q: what is the difference between the poc fornix 2016 and 2017? A: POC only updated the colors from the 16 to 17 season. Q: You are showing that this helmet is "unable to accommodate an audio system". On POC's web site, it shows that a dr Dre neck roll is available for it. Can you please confirm that this helmet is compatible with the neck roll? A: We apologize for the misinformation, the Neckroll is compatible with the POC Fornix helmet. A: This helmet in black offers a shiny finish. 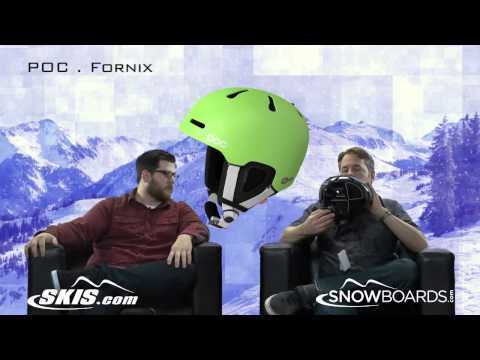 A: The POC Fornix helmet can be used in warmer weather conditions and will provide excellent protection, although it is not designed for base jumping.